Big events – and big spaces – call for a big spectacle. 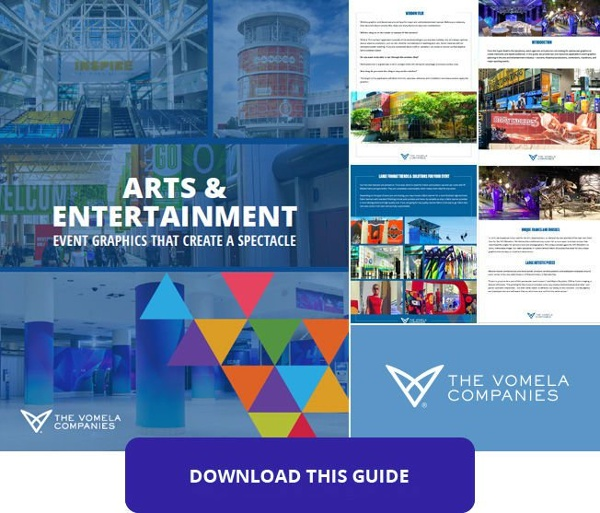 Events of this size rely on eye-catching print graphics to transform ordinary spaces into extraordinary experiences for attendees and the community as a whole. Durability – How long does the graphic need to last? If it’s a one-off event, you can get away with temporary print substrates, less robust adhesives, and disposable signage. If it’s a recurring event, you may want to invest in more permanent solutions like fabric banners, hardware mounting systems, and reusable signage. Time Frame – The event schedule will have implications for virtually every step in the print and installation process. Time sensitivity will determine the method of printing, the speed of shipping, the size of the installation team, and so much more. Make sure to have a good grasp of the schedule going into the project. It’s easy to get caught up in the “wow” moment of large-format print graphics. But the real magic is in the details. There are all sorts of opportunities to create more memorable experiences using print graphics, and the best way to do that is to ask the people who do it every day. Print experts will have all sorts of tricks and tips to ensure you’re getting the most out of every corner of your Arts & Entertainment space. Wayfinding – The best wayfinding is the type you hardly notice. Attendees will only notice if it’s inadequate. Standees – Standalone graphics can be placed anywhere with minimal installation to promote events and provide valuable information. Nontraditional Surfaces – Floors, tables, elevator doors, you name it. A quality print partner will be able to identify branding opportunities that go far beyond traditional signage. Tear-Down – As important as the installation itself. Work with a competent team that will work quickly without damaging the facility. Warehousing – Are you holding onto anything for future use? Make sure it’s packed up and stored properly so it’s ready to go for the next event. If necessary, find a print provider who can provide warehousing services. Disposal/Recycling – If you have material to dispose of, work with your print graphic provider to make sure you’re doing so responsibly. In addition to environment considerations, you can also sell certain types of used material to recycling operations. Are you ready to build your Arts and Entertainment brand?